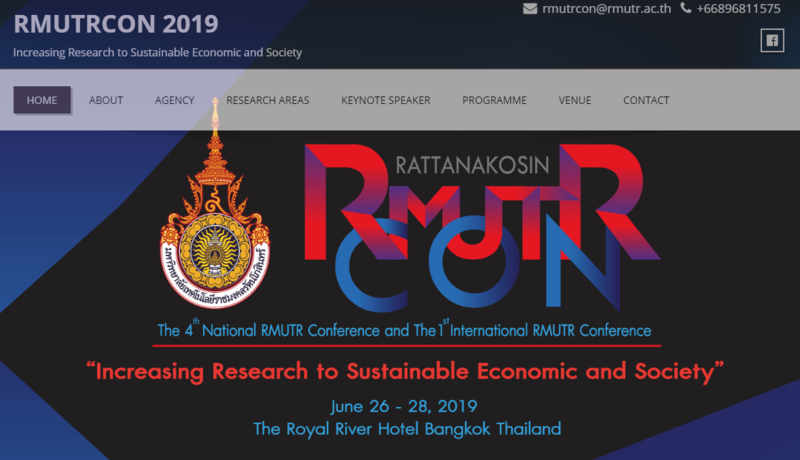 The 1st Rajamangala University of Technology Rattankosin International Conference (RMUTR–Icon 2019), titled “Increasing Research to Sustainable Economic and Society” will be held by dividing into two groups: Integration of Science and Technology, and Social Science for Society and Community Development. The conferences aim to be a stage for research presentation, exchange knowledge in science and technology and social science, and create academic networks among students, lecturers and researchers in related fields. Moreover, these conferences will open you to have the opportunity for learning together to develop research quality in various fields, expand the collaboration network between the university and outside institutions, and disseminate research and knowledge in a wider field. Note: If your manuscript pass to the evaluation process then either accepted or rejected to publish in Proceeding, the registration fee is not refundable. ©2017, Research and Development Institute.